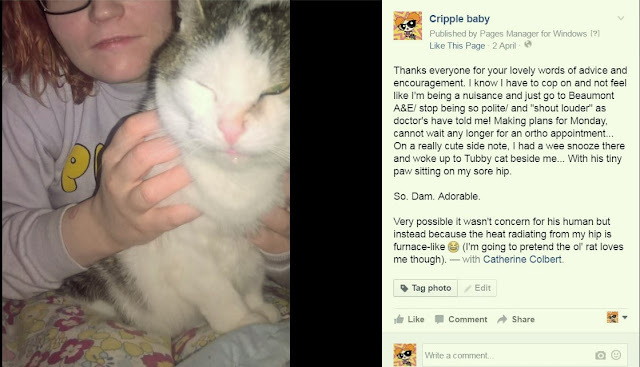 Cripple, baby! : To Dublin hospitals, with love... Etc. To Dublin hospitals, with love... Etc. A.) Where I live the local hospital is basically closed (no A&E, they borrow equipment and staff from other hospitals, etc.) and the other "local" hospital is incredibly understaffed, underfunded and under-equipped in general (It is the main and only hospital for a very large populous, also). C.) I do not "scream loud enough"/ I have been incredibly unlucky (referrals going hay-wire, doctors not admitting fault at my birth, etc.) / I avoided doctors for a huge proportion of my adult life/ and a combo of the usual Irish "sure it'll be grand" inside of me that prevents the "screaming loud enough". after ringing them after a particularly excruciating bout of recent pain, that they never received my forms! *sad face! * (again, such bad luck!). I even had a return address on the envelope, AND I even commented to Bicky at the time: "I bet this form gets completely lost somewhere", lol... So turns out I'm actually just a realist and not negative, har! So (with some a lot of persuasion from my beloved Bicky) I finally bit the bullet and went to Beaumont A&E. Something I hate doing -I don't want to be a nuisance, make a big deal, etc., etc... But I have to remind myself: this is what normal people do when they can't physically move, when they are in extreme pain, or just have a general medical emergency... we of course waited a couple days, so that I could travel in the car. I could not bring myself to ring an ambulance -oh the absolute embarrassment! ...(Again, I know, I have to stop being so ridiculous and Irish. I am trying). My hip tends to pop in and out (going nearly straight back in), and this has become more frequent recently. The skin around the hip is on fire -Like sunburn or any type of physical burn, but with no actual rash. Just boiling to the touch. I can feel it's from the inside-out. Pretty normal with hip dysplasia, but has become unbearable recently. Cold objects are my new best friend. And of course, the ever-decreasing mobility and fatigue which has me lying in bed for most by days. With the former advice of my GP to go to a Dublin hospital when I require emergency help, and not the local one (because of aforementioned budget cuts, lack of specialists, etc. ), we made our way to Beaumont (second time in a few months, this is a record for me, haha). Lovely doctor. Lets call her "Dr. Jane". Dr. Jane Could not understand my story and medical history -why I hadn't had surgery yet, why I was just basically left like this, why I've been on a waiting list for a year when It's a "medical emergency" (her reference, not mine... jeepers)... I explained the issues with our local hospital and that they are incredibly understaffed, but working in a completely different environment, she really didn't get it at all. Made me feel even worse for the staff in Drogheda. Even the receptionist was confused when I first got there: "When is your hip replacement booked for?" she asked when I mentioned I had hip dysplasia... Emmm, 12th of never? I kept having to explain to everyone over and over again that I was still waiting on my initial ortho appointment, lol! "When were you diagnosed? ", the doctor also asked... her face when I replied "as a toddler" -She was clearly expecting me to say only recently. She was stunned, appalled and wants me to go to an orthopedic appointment there soon, as it's an emergency case and if I go there, she can personally request it for me. Suits me absolutely fine! My hospital preference is anywhere that can see me ASAP, haha ...I honestly nearly cried when she said the initial appointment will hopefully "be in 6-8 weeks, sooner if there is a cancellation"! Here's hoping. That's incredibly quick for Ireland (or at least this side, anyway). 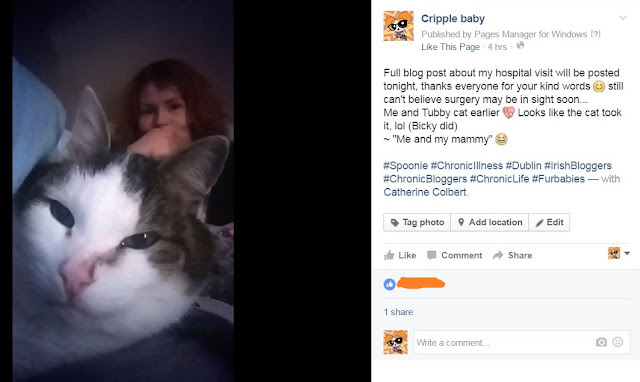 She also commented on how I will more than likely need surgery, and was gentle in telling me that I may need a full hip replacement straight away... As if she was giving me bad news!? So sweet. I stopped her to inform her I am willing and ready and even hopeful for surgery, even a full replacement. I know to most surgery sounds scary... and maybe I should be afraid, but I know it will greatly improve my quality of life. 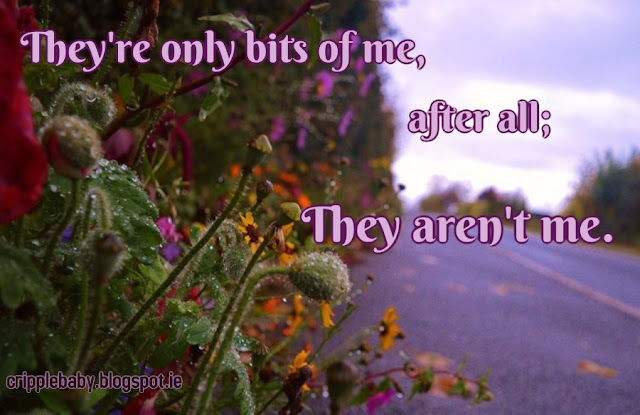 They're only bits of me, after all; they aren't me. ...Take as many away as yas like -I'm totes ready to be a robot! (Etc... the most overused word of the day. Soz for that).